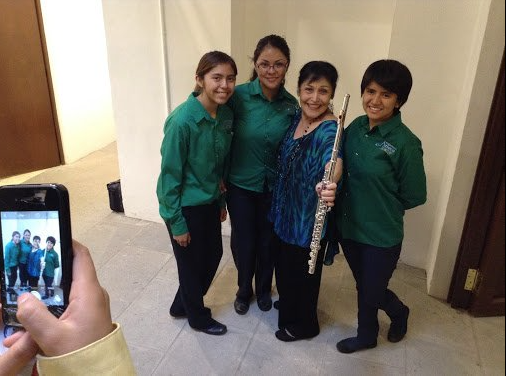 I was introduced to the Esperanza Azteca Orchestra of Puebla last October when I had the pleasure of playing with this amazing group of young people and their conductor Julio Saldana in La Constanza and in front of an audience consisting of members of YPO/WPO. I had heard about the incredible Esperanza Azteca movement but this was my first contact with it and I was blown away. There are 82 Esperanza Azteca Orchestra throughout the Republic with two of them in San Salvador. It is the brain-child of Ricardo Salinas and is guided by Esteban Moctezuma, the Executive President of Fundación Azteca, and it has grown incredibly rapidly in the six years of its life. There are more than 16,000 young people in the 82 orchestras with 1,300 teachers and together they develop important values though music, such as discipline, the pursuit of excellence and teamwork. The result is that these young people not only grow their musical talents but significantly improve their self-esteem and also inspire their families and their communities. In December I was very happy to be present at the inaugural concert of the Esperanza Azteca Los Angeles Orchestra, the first Esperanza Azteca in the United States which is sponsored not only by the Fundación Azteca but also by the Andrew Nikou Foundation. It was a terrific debut and will be first of many orchestras in the US. 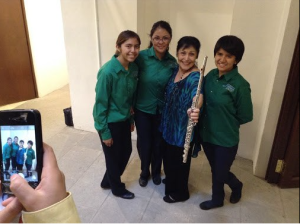 Returning to Mexico in time for the Esperanza Azteca National Orchestra in Sala Nezahualcóyotl earlier this month, I was thrilled to hear two hundred exceptional young musicians under the baton of Mtro Julia Saldana. Yoyo Ma, the world famous cellist, and Mexico’s own Carlos Prieto of course gave stellar performances but it was the young musicians themselves who were the real stars of the show. A highlight of the concert was a new work, CANTO A LA MÚSICA, by my friend and colleague Samuel Zyman written for two cellos, choir and orchestra. An inspiring, five movement work by one of Mexico’s most important composers. Before the concert, composer Arturo Márquez, who is also known for his humanitarian work was presented with Esperanza Azteca’s Medal of Achievement, a very worthy recipient. 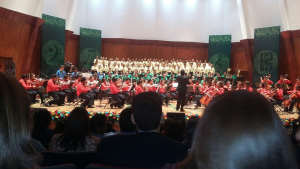 This was a landmark concert which showed just how far the Esperanza Azteca movement has come in six years. The future is very exciting! Why not check out the Esperanza Azteca Orchestra in your area – attend their performances or see how you can join and help to bring the love of music to your communities!